A very different account of Kdo. Koch was given in captivity by the former Operations and Signals Officers of Stab FAGr. 122. As far as these men were concerned, Koch’s unit had moved from Köthen to Trapani in the late summer of 1942 with six He 111. It had been attached to FAGr. 122, carrying out night radar reconnaissance along the North African coast as far west as Philippeville (Skikda, Algeria). In the course of these operations the Kommando tried out a captured British ASV set (appreciated for its good lateral coverage) alongside the homegrown Rostock and Lichtenstein-S. These German sets were unreliable and needed experienced personnel both to operate and to service them but when FuG 200 Hohentwiel became available it offered a much better angle of search and Koch’s specialists trained all of FAGr. 122’s observers to use it. As the foregoing account has shown, other units (e.g. 2. (F)/123 and KG 100) were using search radars at the time but apparently the prisoners were unaware of what was happening in Fliegerkorps X’s area. It may however be relevant that a detachment from FAGr. 122 under Obltn. Rolf Fritzel, the unit’s Adjutant, was operating three Ju 88 A-4 from Kalamaki—where Kdo. 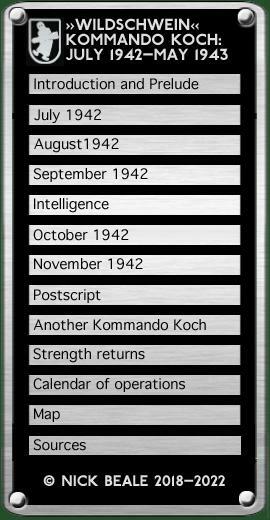 Koch’s Wildschweine were also based—in September 1942. This shows that Kdo. Koch’s responsibilities extended beyond Fliegerkorps X and listening/jamming, and in fact there was at least one search aircraft of the unit operating alongside the Greece-based jammers. If the power requirements of the jamming transmitters were as great as was claimed (see above) it seems unlikely individual aircraft would have been fitted with both these and a search radar, leaving single-role machines altogether more probable. Prisoners in 1941 mentioned Lichtenstein … as night fighter apparatus. There have been no later references. Present references suggest the name … is being used as cover for the German A.S.V. known to have been recently introduced. Possible interpretation is that an early form of airborne RDF … has been modified for use as A.S.V. On the afternoon of 6 November, Luftwaffe authorities in Sardinia were mustering forces against the Allied convoys approaching French North Africa they planned to shadow the invasion force with two ASV-equipped He 111 prior to an attack at dawn on the 7th. They were to maintain contact the following night as well, operating from both Cagliari-Elmas and Trapani. Those elements of the Kommando concerned with search radar were busy on Italian soil until February 1943 when the main body returned to Köthen, leaving only a small group of specialists behind. Their Heinkels had by then been handed over to FAGr. 122 but these proved too slow and FuG 200 was installed in Ju 88s instead. Repair and maintenance of airborne radar was carried out in workshops at Grosseto but these were bombed out on 20 May and so sets had to be returned to Köthen for major repairs. Jean-Louis Roba records the following casualties of the Grosseto raid: Obltn. Josef Schwaighart (pilot) and two groundcrew killed; Obltn. Helge Markert (pilot) and five groundcrew injured. NOTE: Schwaighart’s burial details rank him as a Hauptmann so he may have received a posthumous promotion. An Allied analysis of German operations early in 1943 noted a single flight by “ASV He 111, Trapani” in each of the weeks 27 February–5 March and 6–12 March, alongside this comment: “Probable that most of original detachment given up to KG 26”. An Italian document captured in Augusta, Sicliy recorded that an He 111 had detected an Allied submarine with a Radiolocalizzatore (“radio localiser”) SE of Pantelleria on 3 February.